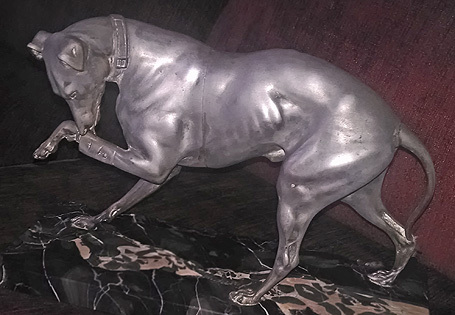 Above: "Wounded Greyhound Dog" by Danish sculptor Adelgunde Vogt, 1860. 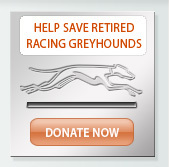 We received a call from a greyhound owner whose dog had been recently diagnosed with lung cancer. The more we spoke to the owner, the more we discovered that lung cancer was really the second part of the story. Their greyhound originally presented with osteosarcoma but lung cancer was then discovered on an x-ray. We kindly explained that the prognosis was nothing less than grim with the only option being euthanasia. As it happens, this greyhound owner had gone from his regular vet to a surgeon who recommended immediate amputation of the dog's cancer-ridden leg. I discussed this with our Medical Director and, while we often disagree on things, we were completely in agreement on a course of action for this dog; possible short term pain medication followed by euthanasia, or immediate euthanasia. From our experience, we knew that every day this dog would feel worse. We both felt that the surgeon who suggested amputation made the poorest recommendation that a vet could make with no consideration whatsoever for the client or the dog. The article below has been written to clarify our feelings in regards to greyhounds and osteosarcoma. We hope that everyone with a greyhound, or any pet, will read this because some day, when you are at your most vulnerable, you may be faced with an unscrupulous vet who will suggest potentially spending $10,000-$15,000 on a lost cause. No one is perfect. Greyhounds, however, come pretty close. They are beautiful, elegant and gentle. They are the closest thing to a perfect dog. Unfortunately, their ability to develop bone cancer transcends that of almost all other breeds of dog. Osteosarcoma, or 'bone cancer', is an aggressive, life shortening cancer. There are options, but sadly, they often carry a poor prognosis and can be very expensive - think $5,000 to $15,000. It is important to be an advocate for your greyhound and educate yourself about both the prognosis and the financial investment before moving forward with a decision to treat or not to treat. In general, if left untreated or with amputation only, a patient diagnosed with osteosarcoma, on average, may live up to three months from time of diagnosis. If treated aggressively (amputation with radiation and/or chemotherapy), the prognosis can be slightly better with a life expectancy rarely exceeding one year of life but usually less. Very rarely, a patient may live up to two years. The typical presentation of a dog with bone cancer is limping and pain. If your greyhound is seven years old or older, don't be content to leave your vet with only an anti-inflammatory, such as Rimadyl. Have x-rays taken of the area in question. There is a typical presentation of how the bone will look when cancer is present. Most veterinarians will immediately recognize this making the diagnosis easier. To definitively diagnose, fine needle aspirates are performed which are easy, inexpensive and accurate. Biopsies can also be done, but they can be invasive, painful and pricey. Usually the radiographic presentation is so typical that fine needle aspirates and biopsies are unnecessary and we typically do not recommend them. Above: These x-rays are of the right and left radius and ulna of the same dog. The x-ray on the right shows a normal and healthy bone. The x-ray on the left clearly shows changes consistant with osteo on the larger bone to the right side. We know this because there are areas of darkness on the bone suggesting lack of calcification. On a healthy bone, as can be seen on the right, there will be a homogenous distribution of calcification. 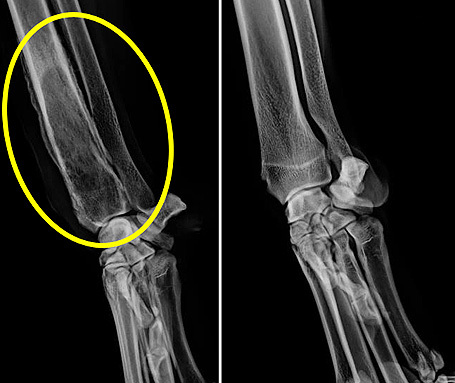 The other identifying aspect that lends support to a diagnosis of osteosarcoma for the x-ray on the left is the widening of the bone on the top right hand side of the circled area. 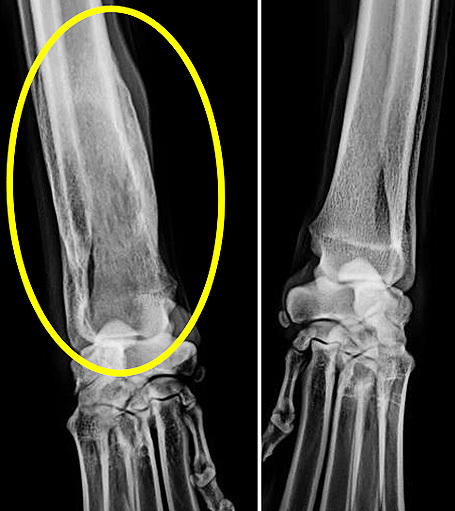 This widening is caused because osteosarcoma commonly pushes out the periosteum, which is the seal that covers bones, creating a radiographic change. Above: These x-rays are also of the right and left radius and ulna of the same dog. This x-ray clearly shows lysis, or dissolution, of the bone which appears as very dark areas. The x-ray on the left shows a non-uniform, or heterogeneous, presentation because you have lysis (dark areas) interdispersed with more calcified areas (lighter areas) which suggests that the bone is being eaten away by the cancer. You can also see the irregular edge on the left side of the bone where the periosteum is being pushed out. The x-ray on the right is a normal bone. Sadly, bone cancer is usually extremely aggressive and will typically spread to the lungs and even to other bones. Once this happens, breathing difficulties and worsening of pain will ensue. Statistically published, there is only a 10% chance that metastatic disease will be seen in x-rays of the lungs at the time the dog presents for the limp and an x-ray confirms bone cancer. 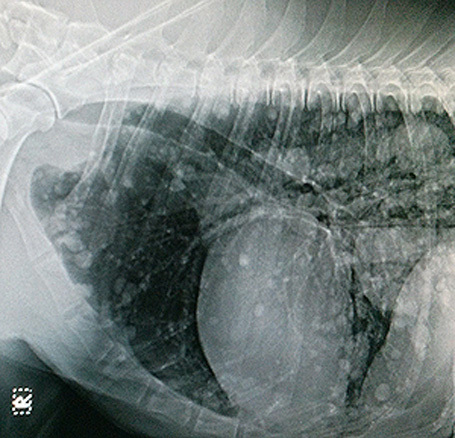 At NGAP/DRVC, we have never seen metastatic disease in the lungs when a dog initially received x-rays for limping and feel strongly that there is a less than 10% chance that lung metastasis will be obvious on chest x-rays at presentation. Many greyhound owners get a false sense of hope when no metastatic disease is apparent in x-rays of the lungs. We want to stress that this is common and that these patients will most likely develop metastatic disease in the lungs in the future. This is a really important point when considering the best treatment option for your dog. When lung metastases are present, this changes the prognosis for the patient. If the dog is having trouble breathing or his or her pain is excruciating, unfortunately euthanasia is probably the best option. 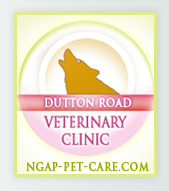 We bring our pets to the veterinarian so that a diagnosis can be made and a treatment can be recommended. We hope that our pet is either cured, if possible, or at a minimum, is made to feel better. Osteosarcoma is a diagnosis that makes this job difficult for a veterinarian. You want your friend to live forever and want to do whatever you can to save him and make him comfortable. However, because this condition is so very painful and the prognosis is relatively poor, the most humane option, sadly, is euthanasia. Why? Because under the most extreme treatment, no matter what is done, your dog will most likely be gone within less than a year, if not sooner. Often times pet owners are adverse to the option of euthanasia. They feel compelled to try something and hope their pet will beat the odds. Your veterinarian can provide various options from pain control only, to amputation, to amputation with chemotherapy and radiation. There are even on-going studies at universities throughout the country geared towards improving the outcome of dogs with Osteosarcoma. Sometimes there is funding which allows these patients to be seen and treated for free. However, the typical situation results in high veterinary bills and poor results. The one major factor that makes osteosarcoma more difficult than other cancers is the risk of spontaneous fracture. Osteosarcoma causes the bone to become extremely brittle at the site of the cancer. If osteosarcoma is on a limb, that limb can fracture very easily at any time, even on dogs that seem relatively healthy and pain-free. One of the main reasons this cancer has such a poor prognosis, especially when it is on a limb, is this possibility. A fractured leg is excruciatingly painful and the animal will suffer. There is always the possibility that this may happen on a weekend or at night after hours when your options are limited and it is both difficult and expensive to put your dog out of its misery. It is much better to plan ahead for your dog's sake. Pain medication is definitely a cheaper, more viable option than amputation and for most forms of cancer, a preferable option. However, the looming possibility of spontaneous fracture makes this option less attractive. This possibility strongly lends support for the amputation option versus just pain management. Above: This is a post-mortem comparison of two humerus bones from the same greyhound that was diagnosed with osteosarcoma. 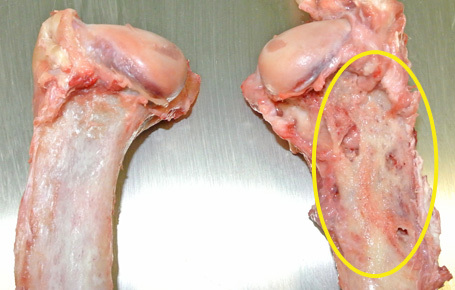 The bone to the left shows a healthy bone with consistent surface and texture. The bone on the right shows a bone with an irregular, moth eaten appearance. This bone would have become more and more brittle as the cancer ate away at it. Above: In a closer view of the bone on the right above we can appreciate that there are numerous holes in it. It is not calcified, solid and uniform. The cancer is destroying the bone structure causing holes and lesions consistant with osteosarcoma. If this bone were to be x-rayed, the moth-eaten areas would have correlated directly with dark areas on the x-ray. Above: As the bone dries out, the damage to the structure is clearly visible. 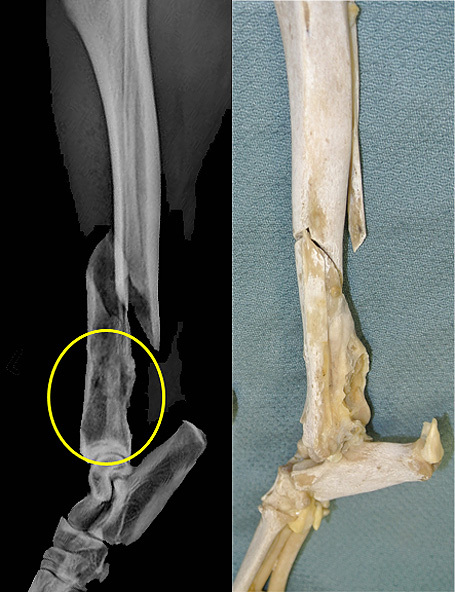 Above: This greyhound presented with a spontaneous fracture due to osteosarcoma. If you decide not to do amputation or any other radical procedures, and your dog is not currently in severe pain, usually the combination of pain medications, in particular Rimadyl and Tramadol, is the first line of treatment. Medication can be really effective for a certain period of time as long as the medication is given and the dog takes it each day. If there is a good response, as there often is, pain medication is continued until the limp is no longer manageable with just medications. Sometimes additional drugs can be prescribed that enable the dog to be comfortable again. With pain management alone, your greyhound will have an average life expectancy of three months or less. However, dragging this time frame out is not in your best interest or the best interest of your dog. The longer you wait, the greater the potential of spontaneous fracture becomes. 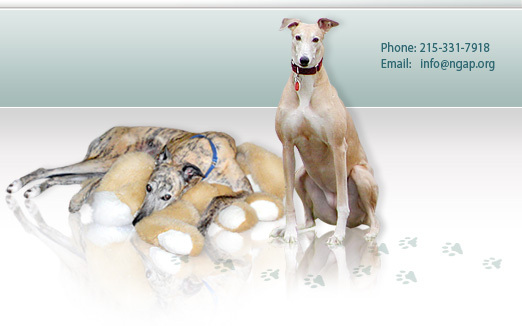 Most clients, if not doing amputation, use this time to say goodbye to their greyhound on their own terms and will euthanize their pet before the cancer metastasizes in the lungs or a spontaneous fracture occurs. If medication doesn’t alleviate pain, the next course of action is either amputation or euthanasia. If you choose to have your greyhounds leg amputated minus the adjunct treatments (chemotherapy and radiation) understand that this move should be considered pain management only. It will eliminate any pain your greyhound may be experiencing from the cancer and will eliminate the chance of spontaneous fracture, but without radiation or chemotherapy (and sometimes even with) amputation will not necessarily increase your dog's life expectancy from that of 3-6 months. 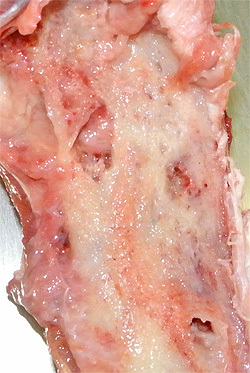 Most likely, the cancer will still metastasize in the lungs after amputation. If you decide on amputation it is crucial that chest x-rays definitively confirm that metastatic disease is not present. Once the cancer is in the lungs, life expectancy declines exponentially. Amputation at this point is contraindicated and the decision to euthanize must come sooner than later. This is a very sad reality. However, a sadder reality would be to put your greyhound and your wallet through an extreme surgery only to have your pet leave you much sooner than anticipated anyway. Above: This x-ray of the thorax demonstrates what it looks like when osteosarcoma spreads to the lungs, called metastatic disease. The little white dots seen throughout the thorax and the large white circle in the right hand corner are consistant with metastatic cancer from an osteosarcoma lesion on a limb. This is close to end stage osteosarcoma. If metastatic disease is NOT present, you must ask yourself the following questions. Will your dog be able to walk on three legs? If it is a greyhound, it should do fine if it has no other pre-existing conditions. Are the hips ok? Is there disease in any of the other legs? It is also important to understand that there is a recovery period and your greyhound may need your physical aid. Theoretically, your greyhound should be fine and back to "normal" within two weeks walking on three legs. At National Greyhound Adoption Program, we normally keep a dog, post-amputation, for one week. This allows sufficient time for the dog to be stable on its three legs, walk and relieve itself comfortably and not be draining any fluids. Many other facilities will release a dog one or two days post-op. The final issue to consider is cost. Leg amputation is a gigantic procedure and hard work for the surgeon, especially in this incredibly muscular breed. Depending on the facility, fees can be upwards of $4000-$5000. You may also have daily costs as well as transfusion fees. And there is always the possibility of complications which will further add to those costs. Often amputation is recommended in conjunction with chemotherapy and/or radiation. Prognosis is improved if the amputation is followed up with chemotherapy and radiation. At NGAP/DRVC, we can do both amputation and chemo on site, but we do not offer radiation. Many specialty veterinary facilities are equipped with oncology departments but the costs can be astronomical. Some universities will offer this treatment for free or for a discounted price. These specialty facilities would be able to best advise you on life expectancy but our experience has been that greyhounds typically will live up to one year but usually less and you may be paying off bills long after your pet is gone. To reiterate, it is crucial to understand the behavior of this cancer prior to embarking on expensive treatments. Unfortunately, some veterinarians are suggesting amputations on patients that are poor candidates. One would like to believe veterinarians would not go to the trouble of recommending such a procedure in the face of already existing lung metastasis as well as other potential complications, but we know that they have. It is important to educate yourself before committing to such a dramatic move in order to protect yourself as well as your dog. Remember that although you need to make a decision quickly, you do not need to make it right away. Sometimes it is better to sleep on your options rather than commit to a costly snap decision. Everyone is welcome to call our facility for a second opinion. Done via telephone, there is no charge for this service. Hopefully after reading this, you will think long and hard about what you would do if your greyhound is inflicted with this unfortunate disease. This will make your decision making process much easier if and when your dog is faced with this disease. It is often hard to think rationally when faced with difficult decisions at such an emotionally charged time. We invest in something for the gain it will provide, but each of us has a different scale of "gain". Just make sure to always consider your dog's quality of life as well as your own quality of life before making any decisions.